The publications listed below can be purchased by completing an order form available here. To order online and pay by online transfer please email your order and you will be sent bank details. Cyril Wratten (compiler). 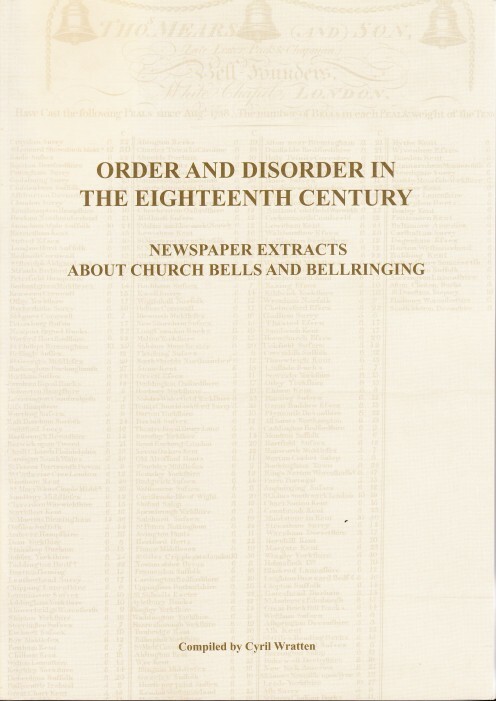 Order and Disorder in the Eighteenth Century: Newspaper extracts about Church Bells and Bellringing, completed, edited and prepared for publication by John Eisel. xvi + 381pp, soft covers, illustrated. This important publication reveals the spread of change ringing, the ‘sport’ among ringers, the distances they were prepared to travel etc. A resource for research projects, an ideal present and a good read! Supplement to Order and Disorder in the Eighteenth Century. Compiled by John Eisel. vi + 72pp, soft covers, illustrated. This supplement contains much new information on London ringing in the second half of the C18th, as well as new material on a number of bell founders throughout the C18th, abstracted from over 70 newspapers. Compiled and prepared for publication by John Eisel. This second volume in the series continues to chart the progress of ringing in the first three decades of the nineteenth century. Another invaluable research resource, an ideal present and a good read! Compiled and prepared for publication by John Eisel. This follows the format of the previous two volumes but, as an increasing number of reports were published, it covers a shorter period. Also included are two substantial appendices containing earlier reports which have become available since the previous volumes were published. Compiled and prepared for publication by John Eisel. Also included are three substantial appendices containing earlier reports which have become available since the previous volumes were published. This will be the last volume to appear in hard copy. All issues of Bell News and The Ringing World up to 1970 are now available in yearly pdf files on the Library Online Publications page (Bell News, Ringing World). They can also be purchased on DVD on application. DVDs containing searchable pdf files, each covering a year’s issues of The Ringing World, plus index. 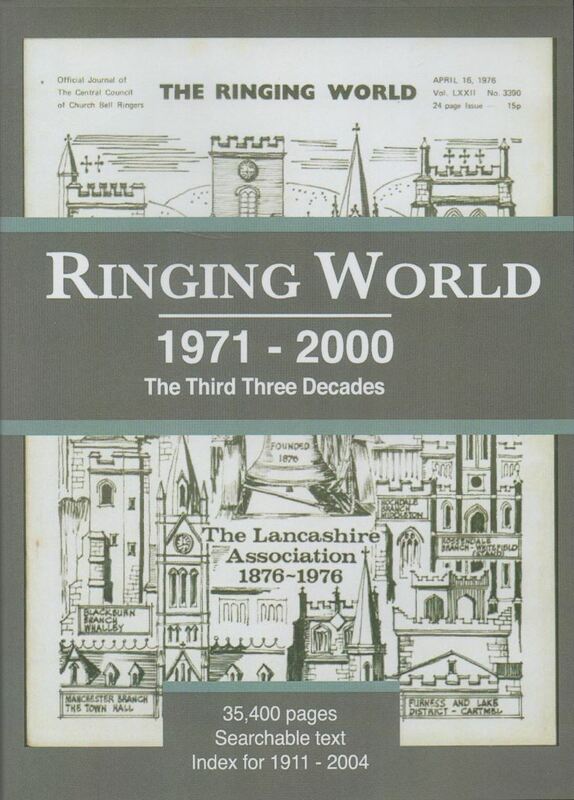 An invaluable source of information for research into ringers, ringing, towers, associations and much more.